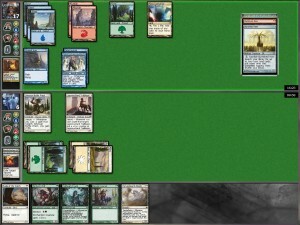 This is a Journey Into Nyx/Born of the Gods/Theros draft. It’s 4-3-2-2 rather than 8-4 because I’ve been getting my head handed to me in 8-4 drafts, even though the expected value is lower. Since my skill level seems to be low relative to other MTGO players, I think my expected value is actually a bit higher in 4-3-2-2. I’ve used the excellent image converter to show the draft, following which I write a little about the games. The best and most valuable card in Journey Into Nyx in my first pack? Yes, please. I’m passing one decent white card and one decent green card here, so I have some hope of being able to slam Green/White to play him, by stocking up on those colors in the second pack. The second-best card in this pack is probably Feast of Dreams. Not much here in Green or White. The person to my right picked the rare. I could have picked Grim Guardian here, planning to go BG or WB splashing for Ajani. The only other card that I think merits consideration here is Nature’s Panoply. Oreskos Swiftclaw is a good card, but Golden Hind is better. As it turned out I should have picked Satyr Grovedancer here. Triggering Heroic is pretty hard in the full block. My plan was that he would be a solid blocker, though, and at worst I could suit him up with Ajani’s first ability. Akroan Mastiff is very good against “Voltron” decks, obviously. He’s a bit fragile, though. Both green cards merit consideration here. It looks like both green and white are reasonably open, which is a good sign. Conditional removal. It worked well for me at the prerelease. Flyer or fattie. Some people really like the flyer, so I decided to try him. I’m not really convinced he’s a good card, though. This was probably the third-best card in my original pack, so I’m very happy it came back to me. Word is that this guy is a reasonable blocker for black control decks, and he’d certainly do a lot to shut me down. Not much for me in the rest of Journey Into Nyx. Let’s see what Born of the Gods has to offer. Very little in the first pack in my colors. Discouraging. Several decent but not outstanding cards here. Aspect of Hydra can lead to some blowouts so it seems like the right choice. Okay, now we’re talking! This is one of the best commons in the set. Decent removal spell. Could have picked another Centaur to be even more aggro. Close call between this card and another Excoriate. Mischief and Mayhem is a possibility, but I don’t think it’s a great card. My deck needs some beefy creatures and this qualifies. Not much here. Griffin Dreamfinder might have been a slightly better pick, but I don’t think it makes a big difference. The Setessan Oathsworn wheeled. I was a bit disappointed that neither Mortal’s Ardor nor Mortal’s Resolve did. This is not a good card, but it’s probably better than 12th pick. Born of the Gods was okay, but not great. I’m gonna need a good Theros pack to have a solid deck. Now that’s what I’m talking about! Boon Satyr is one of the best Bestow cards in the set. This is not really even a close pick. I was just thinking that I could use some decent flyers. Another good Bestow card. Things are looking up! It’s between this guy and Nessian Courser. I hunk Hopeful Eidolon is just the better card. The only decent card in my colors is actually a pretty good card. Not a great card, but he can help clog up the ground if someone’s fatty is getting out of hand. I’ve learned from experience that this guy is worth playing even if you’re not playing blue. A 3/2 for 3 in this format is just plain worth running. Heck, at the prerelease I ran a 3/2 for 4 and was never sad to see him. Neither of these white cards are good. Oh look, I ended up with both of those not-good cards. This is an excellent card to have wheel from this pack! Opaline Unicorn doesn’t do much for me, but I don’t want someone to get a cheap Rage – it’s much better than a 12th pick. 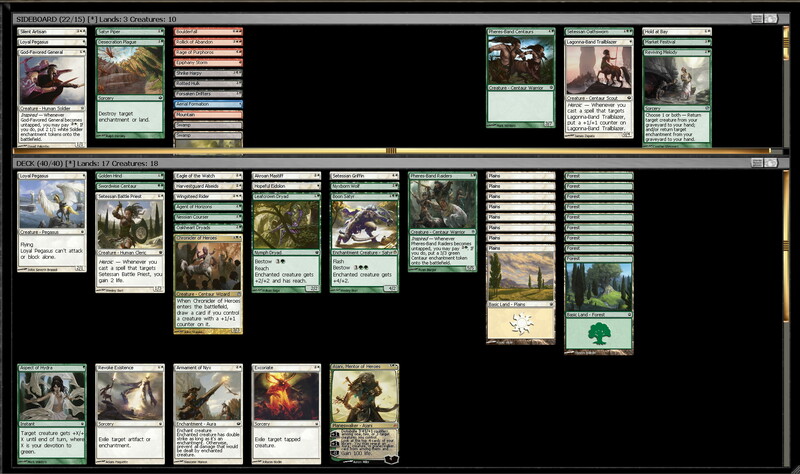 Two people picked a Minotaur Skullcleaver and a Firedrinker Satyr over this, which seems questionable to me. If this guy were a 2/1 for 2 then I might run him. In the end I was kind of unhappy with both the Noble Pegasi and the Lagonna-Band Trailblazer. I’d rather have had another 2-drop, or at least a green 1-drop. Running white 1-drops with Swordwise Centaur is discomfiting. Heck, I’d have happily swapped them for a reasonable 5- or 6-drop fatty (maybe I needed the Vulpine Goliath! ), or better yet a good 4-drop. Overall it’s an okay deck, and has a few tricks I can pull out. Sadly I was not sufficiently on the ball to take screenshots of the games that I won, and I can’t figure out how to replay games in MTGO (it seems its ability to do so is tricky and limited), so you’ll have to live with text descriptions. My first opponent was red/green, and had a couple of fatties that ran me over in the first game, as I drew 8 lands in my first 14 cards. In the second round my opponent was playing blue/red splashing green (I don’t think I ever saw a green card from him, so it must have been something expensive and good). The first game was the war of the 2/3s and 3/2s, and he was grinding me down with an Intimidating Bladetusk Boar. We ended up in a state where he got me down to 1, but I had 3 creatures and he had 2 blockers, and he was at 5. I attacked with everything, he blocked 2 creatures, I Flash-Bestowed my Boon Satyr on my unblocked creature and he didn’t have an answer, so I won. The second game was nastier as he had removal for most of my stuff, I never drew removal for his Bladetusk Boar, and I couldn’t race him. He played more flyers on this turn and I could deal with some things, but not everything. So that was it for me. He also had a really strong card-drawing deck, so if I didn’t put pressure on him early then I was probably not going to win. So getting mana-screwed was just the kiss of death. Annoying because I think I could have made the third game competitive if I’d been able to curve out. Also frustrating: I never drew my Hopeful Eidolon all day, and drew Excoriate only once. Either one of those would have turned the tide of at least one game. But realistically I think I lost to a better deck. Anyway, I won 2 packs for my efforts, plus Ajani is worth more than the cost of a draft right now, if I ever get around to selling my online cards. However, I’m definitely not a winning player at draft in MTGO at this point, and I’m struggling to figure out what I need to do to improve my game. This time around I didn’t make many errors on the play, but I still have room for improvement in drafting. So I need to make progress on that.